I’ve had many a good night’s sleep after gorging on dumplings and many a good dreams about them too. Whether it’s steamed, fried, or both, dumplings are a celestial delight. 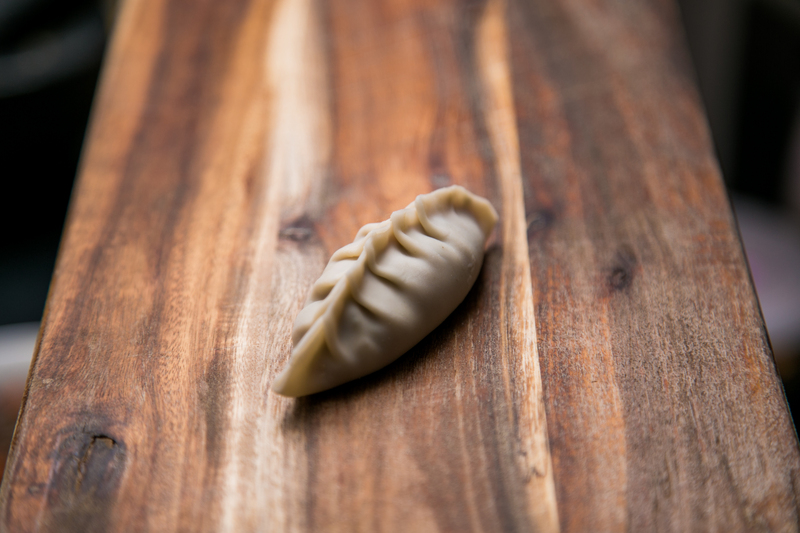 And I assure you, this pork pot-sticker dumpling recipe is everything you want. It even scored me a win on The Chefs’ Line! Dumplings (called jiao zi in Chinese) come in many varieties. One of my favourites are the pot-sticker style. 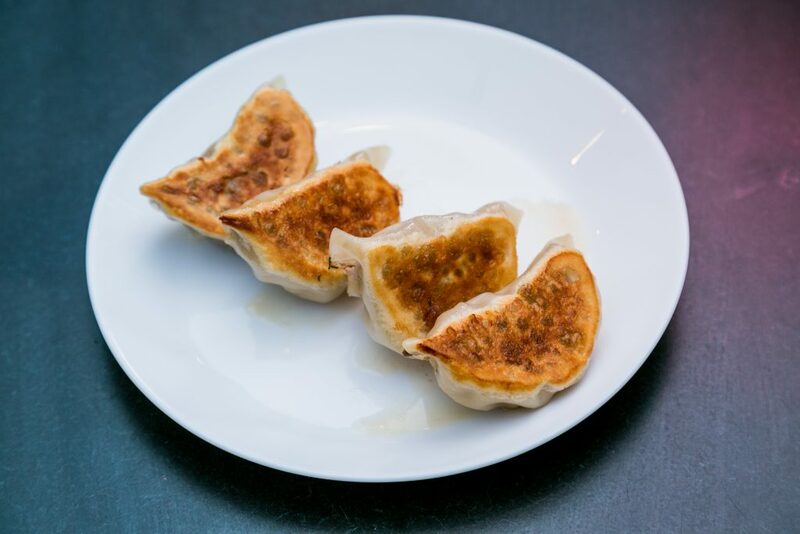 Pot-sticker dumplings are dumplings characterised by a golden crispy bottom and light chewy top. This dual texture is achieved by first pan-frying the dumplings before steaming. It’s a scary technique filled with splashing hot water and oil, but one that results in textural heaven. A great pot-stick dumpling has two main components: a juicy filling and a crunchy and silky pastry skin. The juicy filling is achieved by having a fatty-pork. The fat liquefies upon cooking, adding moistness to the dumpling. Juiciness is enhanced by a lot of liquid seasoning, in this case, from the warming power of shaoxing wine. The ideal pastry skin offers crunchiness and chewiness when consumed. This is only achieved by hand making the dough. 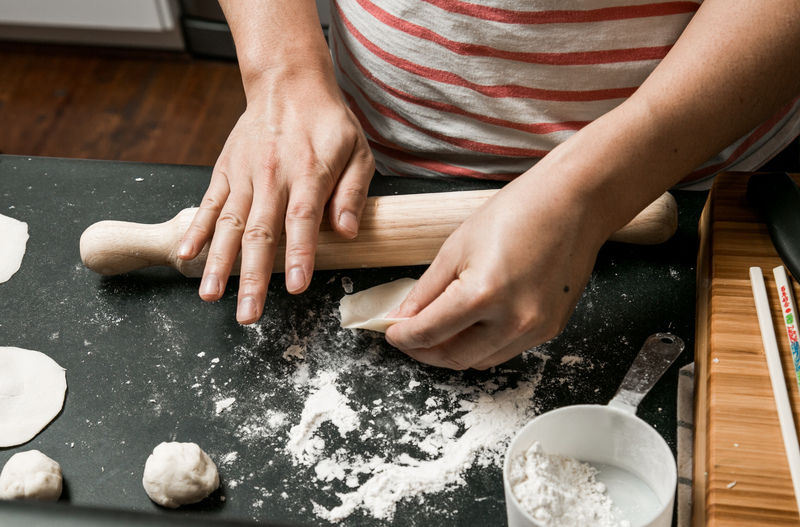 Thankfully, the dough used for dumpling skins is a fairly basic dough, which you may have already mastered. However, there’s no shame in buying store-bought pastry, which don’t have the same great texture but is easier to pleat . Of course, a great dumpling is also one that is plump, with just-the-right ratio of filling to dumpling skin. There should be no holes and all the moisture should be contained inside the delicate parcel. Thus, folding and pleating dumplings is a skill in itself. While some people are daunted by the prospect of folding dozens of dumplings, I take a different take. When folding dumplings, I completely zone out and enter relaxation mode. So, the process can be as arduous or calming as you like. Finally, there is the cooking, which takes patience and a good-eye. 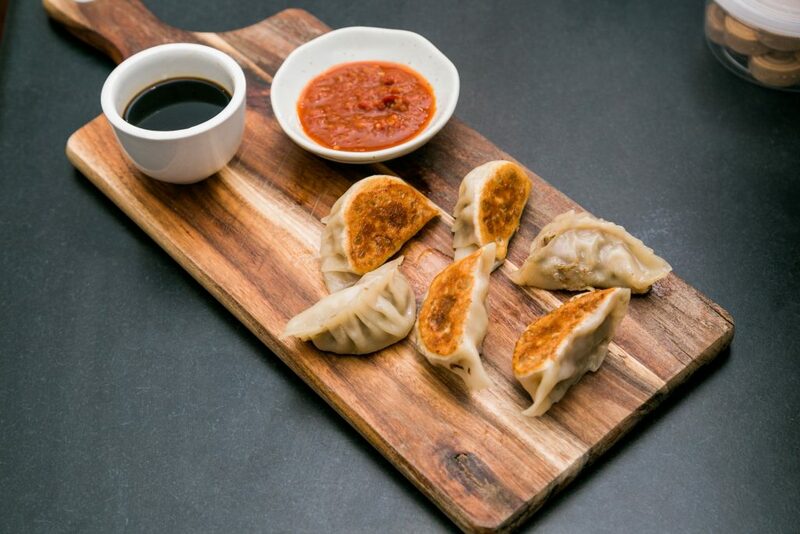 Pot-stickers are first fried before being steamed and then fried again. The first frying browns the dumpling base, the steaming cooks the entirety of the parcel and the final pan-fry evaporates excess water. Always keep your pan on a low-medium heat, tending towards the low side. Let the dumplings brown slowly so that they don’t burn. Don’t worry, they shouldn’t stick to the pan! If you’re nervous about making dumplings for the first time, take it easy. Buy the pastry skins and focus on the filling, folding and cooking. If you have a friend that’s done it before, maybe coax them over to your house for a lesson. Failing that, the video below, by legendary Australian cook Poh Ling Yeow, gives a pretty neat visual demo. The recipe below is for simple pork filled dumplings. Once you master this filling, feel free to make your own additions (like grated carrot and fennel in the pictures above). I’ve chosen to serve mine with a simple black vinegar dipping sauce, which adds a burst of asperity to each bite. A vinegary chilli sauce works equally well. Good luck and have fun! 1. 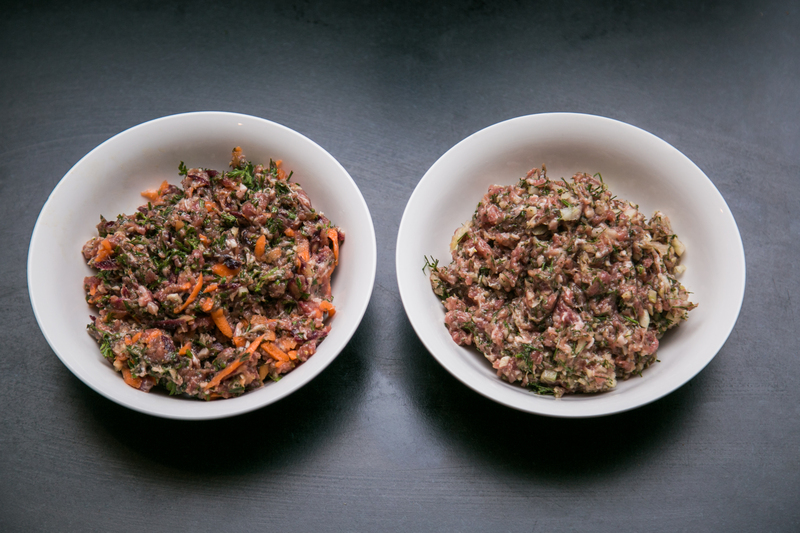 Combine ingredients for the pork filling and set aside. If making dumpling skins from scratch, continue to Step 2. If using store-bought wrappers, skip to Step 4. 2. Roll out basic dough into a log, with a diameter of about 3 – 4 cm. Cut the log into 3 cm chunks and roll each chunk of dough into ping-pong sized balls. 3. On a floured surface, take each ball of dough and flatten to a disc. Place the disc in your left hand and, with a rolling pin in your right hand, begin to roll the disc. Roll the rolling pin up and down, such that it gently flattens the edges of the disc. At the same time, rotate the dough in your left hand, such that every side of the dough is flattened evenly. Aim for a dumpling skin that is about 5 – 7 cm in diameter. The edges of the skin should be about 2 mm thick, with the centre of the skin being thicker. Repeat for the remaining dough. This will take some practise. You may wish to reference a Youtube tutorial. 4. Take one dumpling skin and place about a teaspoon of pork filling inside. You may need more or less filling, depending on the size of the skin. 5. 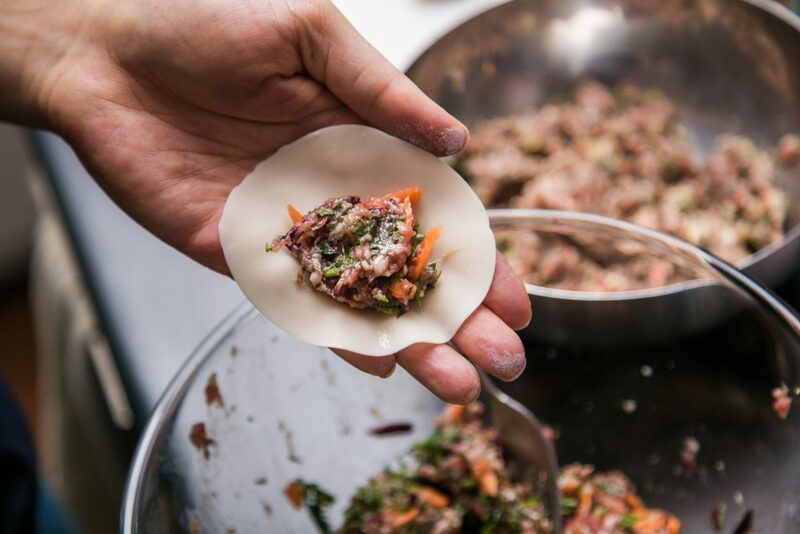 Wet the edges of the dumpling skin and pleat. To form a basic pleat, lay the unfolded dumpling on a flat surface. Starting at one end, pinch the skins together. Then, with dextrous fingers, form pleats on one side of the skin, pressing firmly as you go. Continue along the full length of the dumpling. Again, pleating takes practise and you may wish to consult a Youtube video. Repeat for the remaining dumpling skins and filling. You may have leftover dough or filling. 7. In a quick motion, add 100 mL of freshly boiled water to the pan, and quickly cover with a tight fitting lid. Be careful, the hot water may spit from the pan! Steam for about 5 minutes until the dumplings are cooked-through; the dumpling skins should be slightly translucent. 8. Take the lid off the frying pan and allow the excess water to completely evaporate. Remove the dumplings and serve immediately with the black vinegar dipping sauce. Thanks to Philip Gibson for the photos!